For a quick quote from one of our storage experts. Request Quote Validating... 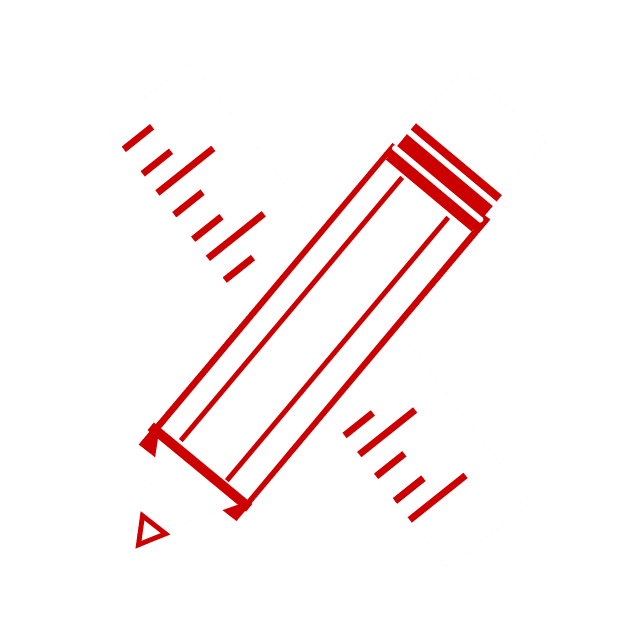 Fix form errors before continuing. Submitting... Successfully Submitted! Something went wrong. Contact Us. Not a problem! 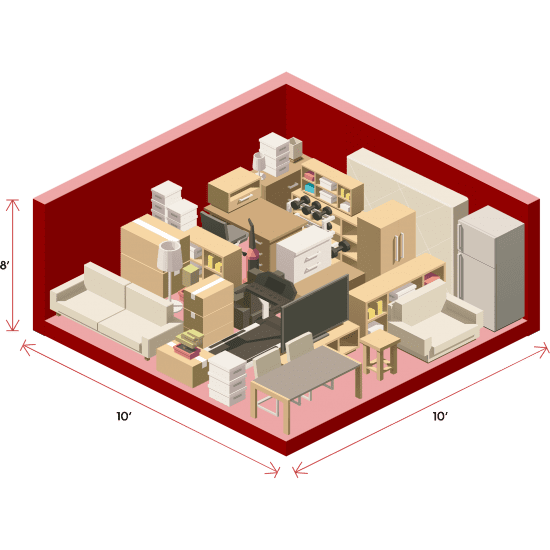 Give our storage unit size calculator a try. 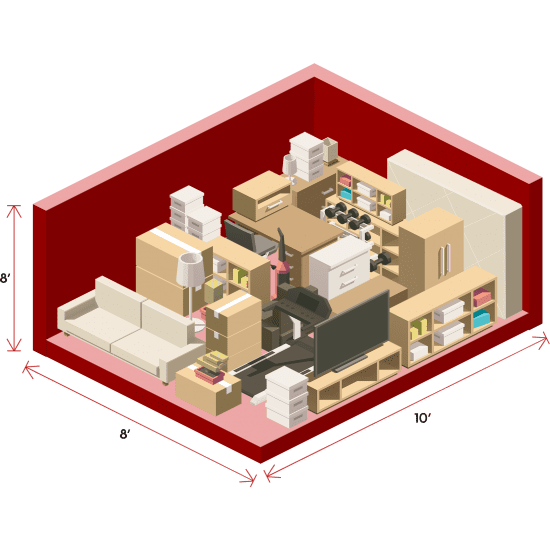 It will give you an approximation of the storage unit size that you’ll need to store all of your stuff. Pick from a selection of predefined furniture sizes, or enter in your own. Our 4 x 4 unit is considered a personal storage locker and offers 16 square feet of available space. This unit is perfect for stowing small seasonal items or keepsakes you want to keep safe. Not sure if this is the unit you need? 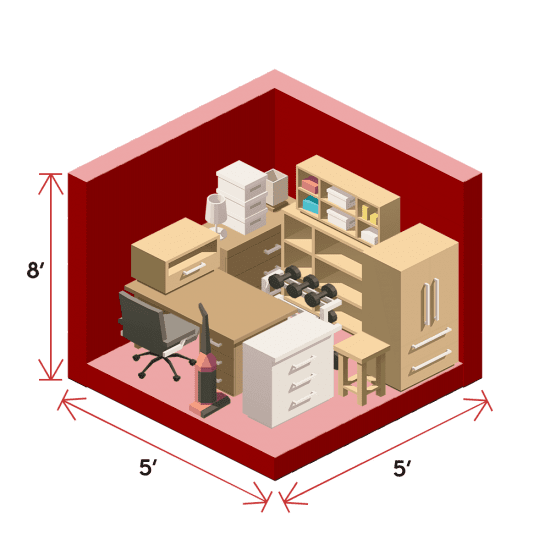 Use our Room Size Calculator to figure out the best size for your stuff. With 15 square feet of available space, our 5 x 3 rooms are great for small items like file boxes, photo albums, seasonal clothing and tall, slender items like floor lamps. Our 5 x 5 units provide 25 square feet of usable storage space. This room is perfect for storing small furniture or seasonal items like holiday décor, sports equipment and gardening tools. 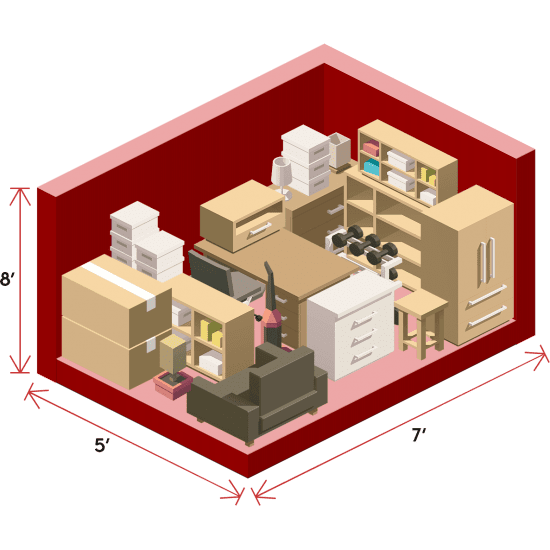 Our 5 x 7 units provide 35 square feet of space, which is perfect for dorm room furniture, boxes and small sports equipment like golf clubs or free weights. 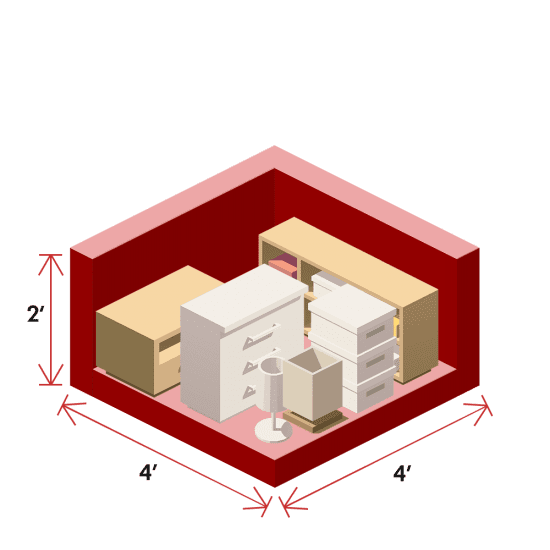 With 50 square feet of space, our 5 x 10 units can accommodate the contents of one room. This includes larger furniture pieces like chairs, dressers or sofas, in addition to smaller items like lamps, televisions and boxes. 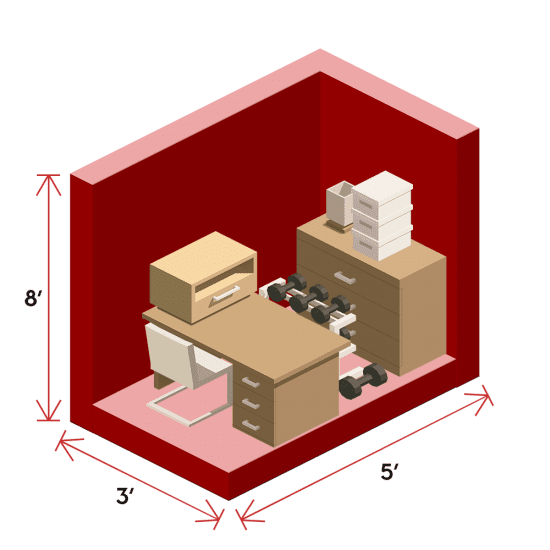 Providing nearly 60 square feet of space, a 6 x 10 unit is the perfect size for stowing desks, tables and other large furniture pieces in addition to moving boxes and other small items. Our 8 x 10 unit offers 80 square feet of space, perfect for storing the contents of a studio apartment without major appliances. 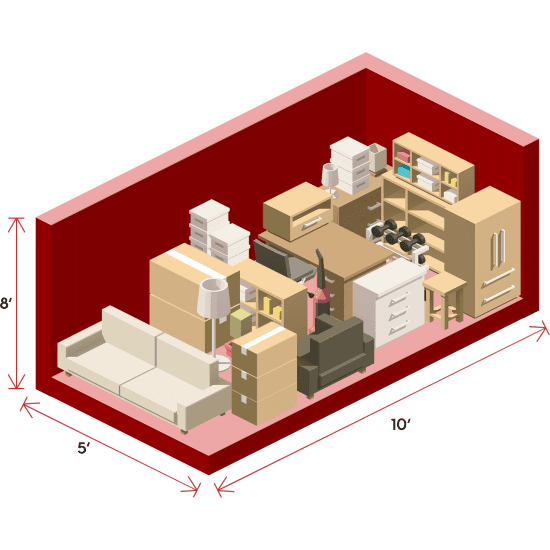 Our 10 x 10 unit provides 100 square feet of space, which can comfortably accommodate the contents of a one-bedroom or studio apartment. 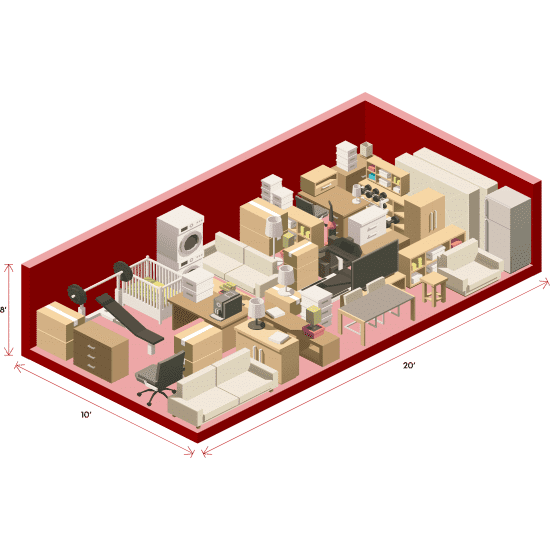 This room is a great option for storing dining rooms sets, office furniture and kitchen appliances during a renovation, relocation or extended travel. 120 square feet of space is available in our 10 x 12 room. 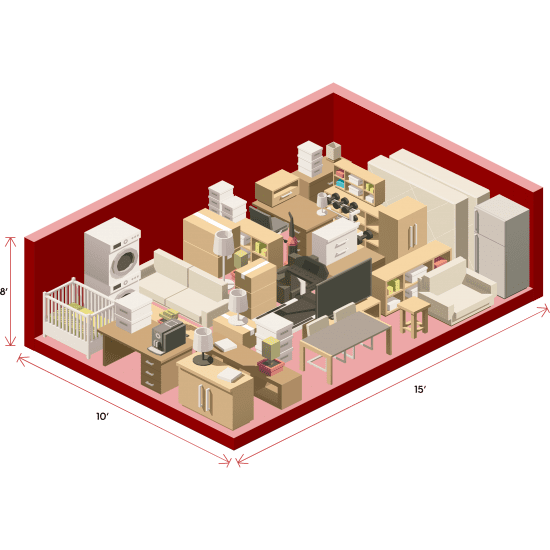 The contents of an average sized one-bedroom apartment can easily fit within the unit, including a washer/dryer. 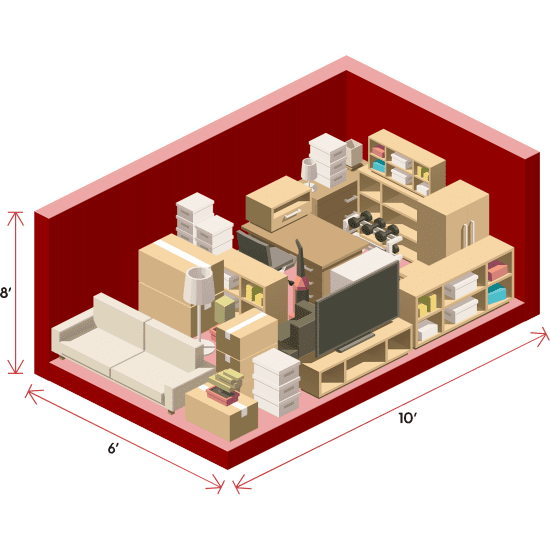 With 150 square feet of available space, our 10 x 15 unit is the perfect size to store the contents of a two-bedroom apartment. Sofas, armchairs, bedrooms sets and major appliances can easily fit in this unit. Our largest* standard unit, the 10 x 20 room has an impressive 200 square feet of available storage space. 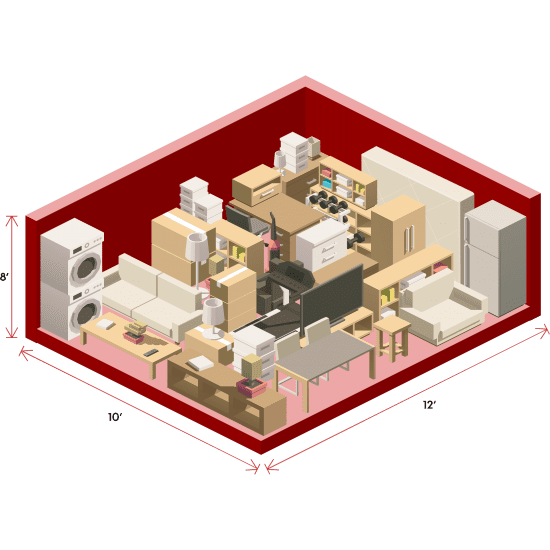 Easily store the contents of a two- or three-bedroom apartment in this unit, including bedroom sets, large living room furniture, bookshelves, cabinets, sports equipment and more. 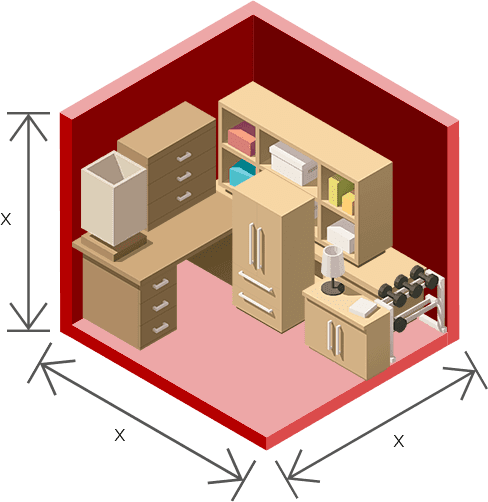 A storage calculator to help you find the perfect fit for your unit. Pick a piece of furniture from our pre-measured selections, or enter custom items with your own measurements. Checkout all of your stored calculator items at a glance. Let Us Handle The Heavy Lifting - At No Extra Cost To You! For the same price as traditional self storage, we’ll take care of every aspect of the storage process. need to lift a finger! and fire suppression tech, we keep your stuff safe! units begin as low as $29/month and free pickup is available. when you commit to storing for at least 3 months. you want to be able to get to them easily, right? Check out what everyone has to say about Moishe’s Self Storage. Very organized and professional, have a very personal client approach and will be as flexible as they can to fit whatever unusual needs you have. Sets them apart from all other companies. Competitive prices. Free pick up! Friendly staff! Bright and clean rooms. What else does a girl want while she tries to juggle life, which somehow becomes 22 boxes. You have to commit to a three month contract for the free pick up but it is fair! They were extremely professional, careful and efficient. They answered my numerous questions and accommodated last minute changes. I would recommend Moishe’s to anyone. Very helpful staff, handled my request quickly and efficiently. The place is clean, well maintained and very well organized. I had no trouble finding my new unit with plenty of signs to guide you. The movers helped package all of my things and furniture safely. The facilities are well lit and easily accessible. Getting my things was a breeze and the staff are very friendly and easy going! The movers were great! Our window was from 9am to 11am. They came exactly 9am in the pouring rain. They packaged all our furniture neatly in two hours and delivered it to our storage. Always helpful when i call, and the facility is clean and safe. Absolutely perfect service … flawless. Courteous crew arrived right on time, and moved a large number of boxes without so much as even hitting a wall (despite really tight quarters). Could not be more pleased. Process was easy and efficient. Space is secure and clean. I have had storage at Moishe’s for some time and just want to mention the helpfulness and fair mindedness of the staff toward long term tenants. A special thank you Yaniv and to Monica. They arrived on time, knew what they were doing, were courteous and quick, moved everything out and away speedily. What more could one ask for? I moved all my stuff from a one-bed apt to the storage, using the free pick up service. The movers came were highly professional, efficient, and nice. I honestly cannot convey how happy and satisfied I am with Moishes. They were polite and friendly and took great care in packaging my things. Very professional. I would not trust any other moving and storage firm at this point. They truly are A+++ This is not a paid endorsement. I am a legitimate customer, and this is the second time I have relied on them. I couldn’t have asked for a better moving and storage experience. Such fantastic customer service. Fast, efficient, affordable – and so friendly and helpful. 8am – 5pm on Sat. & Sun.